The first thing you should know about Sydney McLaughlin is that she’s 14 years old. A shade over 5 feet, 8 inches, the soon-to-be sophomore from Union Catholic, N.J., may be tall for her age, but she’s still 14. Two years old. Most babies are playing with blocks, but not Kaylin Whitney. 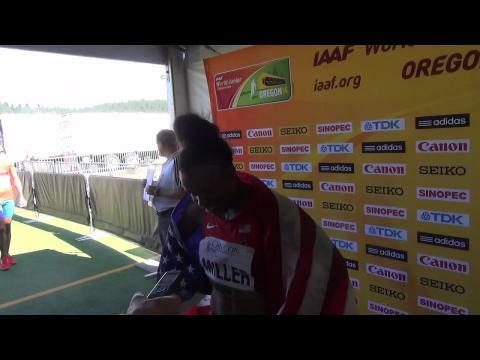 She was preparing her legs for block starts. 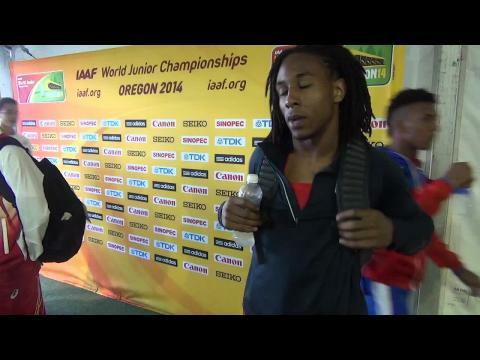 The explosiveness and power in the top high school sprinter in the country came from what else; a Jolly Jumper. An internet search shows an image for the toy which looks like a trampoline for tots. 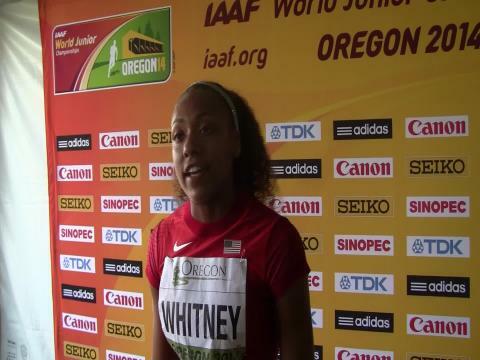 Whitney says she was always in the Jolly Jumper and remembers those days fondly. 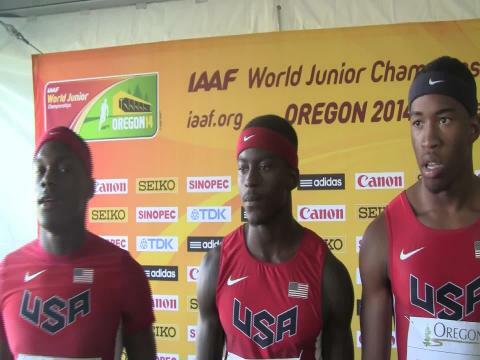 With arguably the most talented relay that the United States has ever assembled for a World Junior Championships between Trentavis Friday, Trayvon Bromell, and Kendal Williams completed by opening leg Jalen Miller, the team nearly flirted with a World Junior record. The US team did accomplish the main goal. 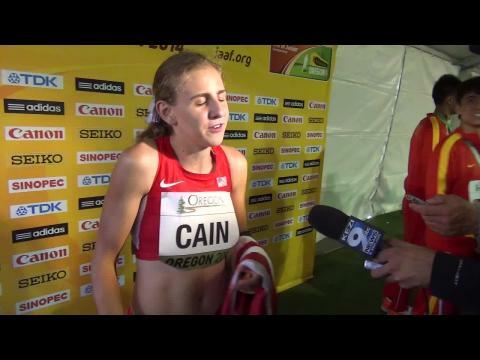 Watch their gold medal race video and post-race interview. 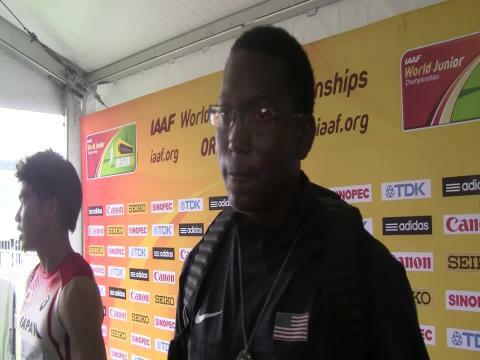 Two of the best sprinters to come through Florida in recent years squared off in the 2014 IAAF World Junior Championships. 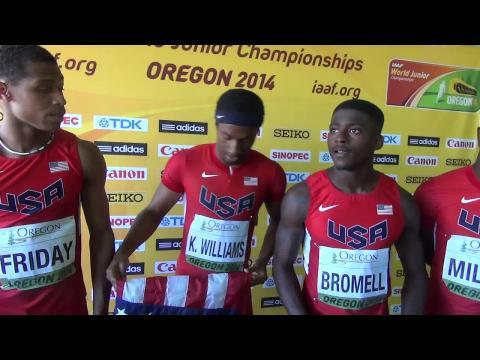 Trayvon Bromell (c/o 2013) and Kendal Williams (c/o 2014) went at it in the 100 meter final with the younger Williams coming out as world champion! 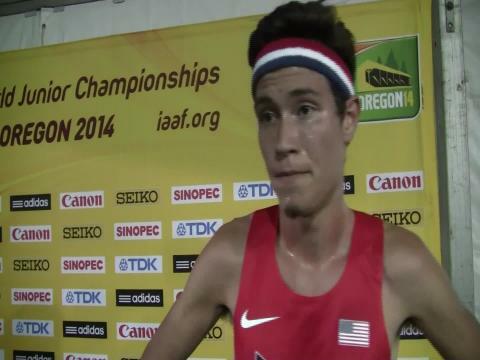 The outcome is FloTrack's #5 upset of 2014. 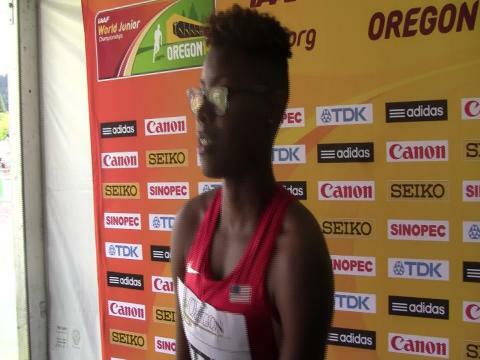 A couple of interesting situations occurred at the USATF Junior Nationals with either event champions or top 2 finishers with the IAAF World Junior qualifier standard not meeting the criteria to be selected by the USATF and/or eligible according to the IAAF to be on the US team for the upcoming World Junior Championships in Eugene. Here is our unofficial World Junior Championships "Snub Team" for the United States. Competing against top sprinters from Jamaica, Anguilla, Nigeria, Japan, Great Britain, and Trinidad & Tobago, Trentavis Friday created a continent separation between him and the rest of the field in the men's 200 meter dash finals at the World Junior Championships as he pulled away with a decisive victory in a wind-aided 20.04 clocking. Photos by Matt Holton and Kiana Smith. 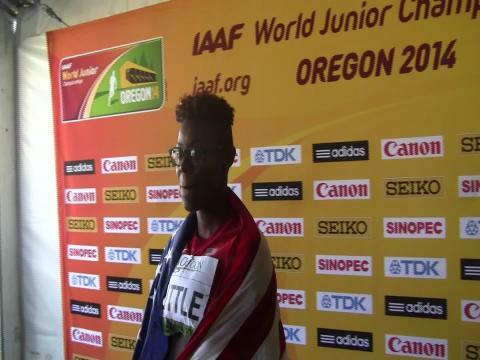 Record-setting high schoolers and NCAA champions highlight Team USA's 89-member roster for the 8th IAAF World Junior Championships, scheduled for July 22-27 at Historic Hayward Field in Eugene, Oregon. Kim Batten considers one of her protégés, recent New Balance National Outdoor 400m IH champion Kenny Selmon of Pace Academy, Ga., among a very small group that have potential to match the excellence of past great U.S. Olympians and his consistency to never break stride in the demanding race. 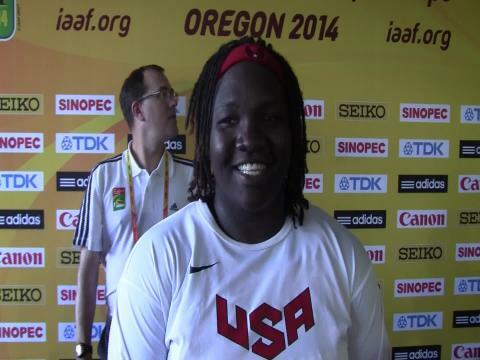 On her final throw at the World Junior Championshipsin Eugene, Raven Saunders moved up from bronze to silver medal in the women's shot put. 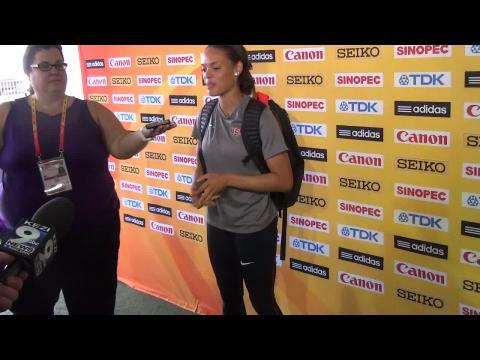 Watch Saunders' final throw in the women's shot put video highlights along with her post-event interview. 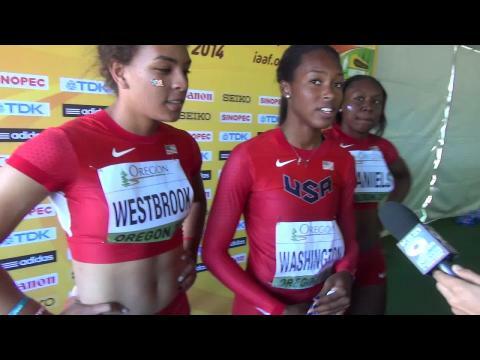 Watch the American team of Shamier Little, Olivia Baker, Shakima Wimbley, and Kendall Baisden take on the World's best and come through as the champions at meet end in the 4x400 meter relay finals with a World Junior leading time of 3:30.42. 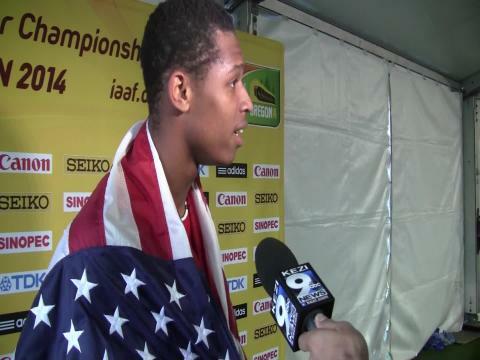 Race video above and post-race video interview below with the U.S. quartet after their victory at the 2014 IAAF World Junior Championships. 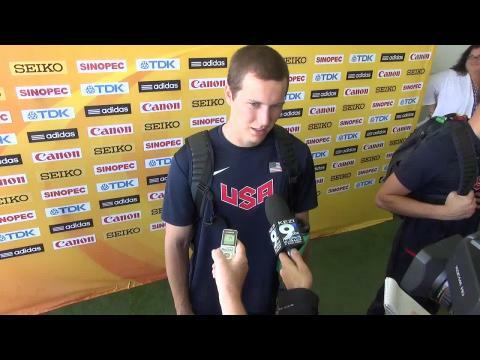 Thanks to YouTube and the internet, Myles Marshall has had the chance to watch one of the all-time great 800-meter races in U.S. history over and over again, a race that holds special meaning to the senior-to-be from Kingwood High in Texas. 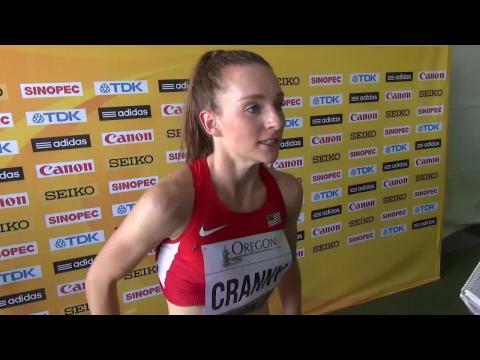 Two one of the fastest high school girls in United States history found themselves mixing it up with the Kenyans and Ethiopians in the women's 1500 meter finals at the 2014 World Junior Championships between Elise Cranny from Colorado and Alexa Efraimson from Washington. 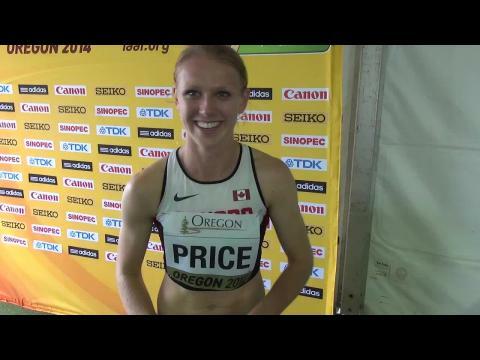 Watch their race video and post-race video interviews. 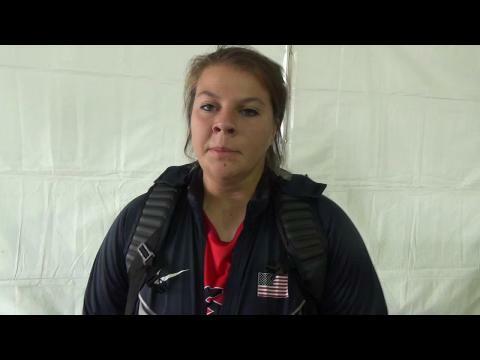 By her high standards, heptathlete Ashlee Moore didn’t have her best outing at the Great Southwest Classic in early June. 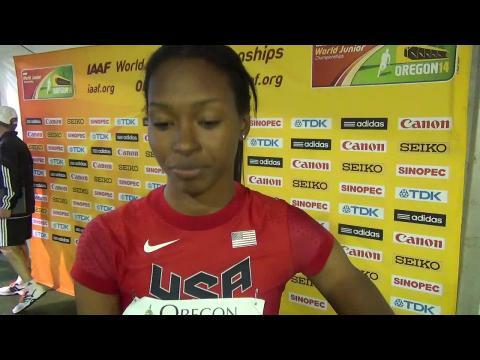 The recent graduate of Hamilton High, Az., wasn’t exactly pleased with her performance last week at the USATF Junior National Outdoor Track & Field Championships, either. One could only imagine what would happen when she does get it all together? It's been a long, and wildly successful, season for Elise Cranny, but the race of her dreams still awaits. Colorado Track XC file photo by Alan Versaw. A list and table of winners from the US Junior Nationals and qualifiers for the World Junior Championships. 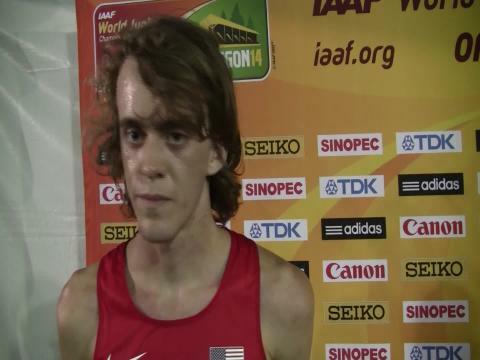 Top 2 advance to World Juniors as long as they meet the IAAF meet qualifying standards. Raven Saunders finished second in the shot put with a best throw of 54 feet, six inches. Tianqian Guo of China was first in 58 feet, 1 inch. 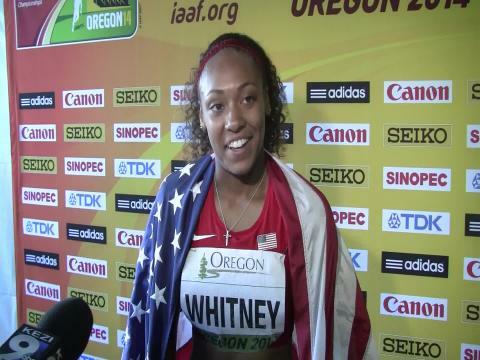 A bronze in the 100 finals and near false start prior to the 200 finals, Kaylin Whitney of East Ridge High School in Florida put all that behind as she stormed down the straightaway at Hayward Field to a 22.28 gold medal victory in the women's 200. 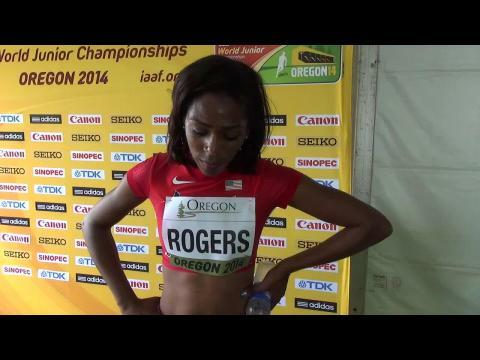 Watch her race above and video interview. 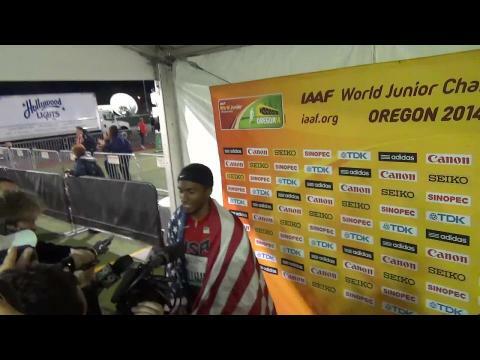 The stages keep getting bigger for childhood friends Trayvon Bromell and TJ Holmes. The pair have been racing each other since they were in grade school. They joined the same youth track club and grew up together. They both attended high school in south Saint Petersburg and they both landed on the prestigious Baylor track team for their first year of collegiate track. They are college roommates and will even be rooming together for the World Junior Championships in Eugene, Oregon this week. A list of Americans competing and highlights of their performances from the Tuesday morning session at the World Junior Championships. 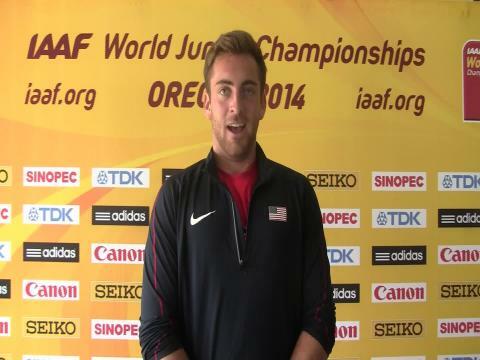 What is required to make the 2014 IAAF World Championships squad for Team USA below! 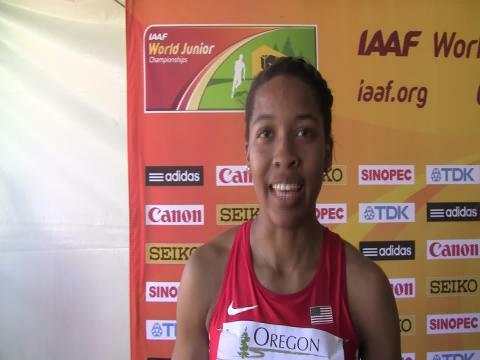 Find out here with the USATF Junior National Outdoor Track & Field Championships approaching as the sole qualifier meet for World Juniors, which will be for the first time held on US soil at the University of Oregon's Hayward Field in late July. 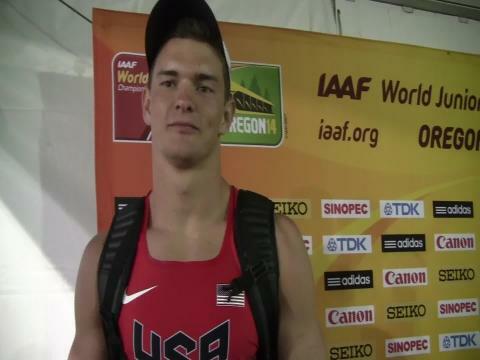 Tennessee’s Harrison Williams considers his mental approach to the decathlon his strength. The recent Memphis University School graduate demonstrated his ability to remain focused to the task at hand during last week’s USATF Junior National Championships (June 27-29) in Sacramento, Calif., held separately from this weekend’s meet in Eugene, Ore.
A list of Americans competing and highlights of their performances from the Tuesday evening session at the 2014 IAAF World Junior Championships in Eugene, Oregon. Haley Showalter dominated the Great Southwest hammer earlier this summer with a PR throw of 193-4. Photo by Alan Versaw. 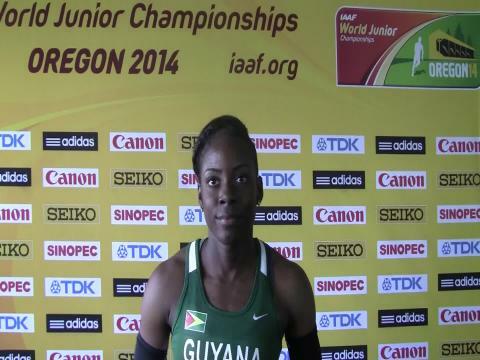 Coverage central from MileSplit of the 2014 IAAF World Junior Championships. 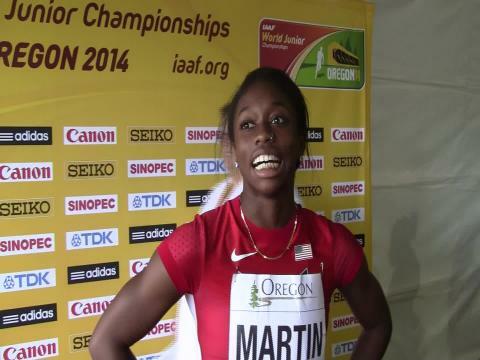 Find twitter updates, links to all important meet information, pre-meet coverage and stories as well as our comprehensive on-site coverage over the next week at Hayward Field with video interviews, recaps, stories, photos, results, and more! 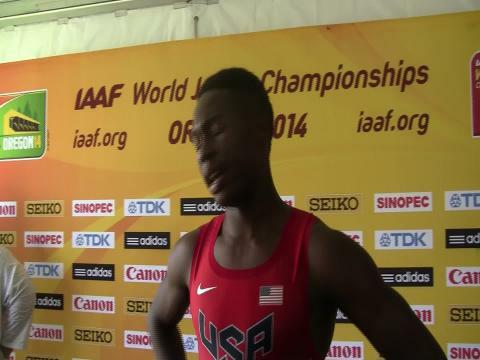 Results, twitter updates, photos, and video interviews from Thursday's evening session (day 3) at the 2014 IAAF World Junior Championships. Highlights, twitter updates, results, video interviews, and photos from Thursday's morning session at the World Junior Championships. 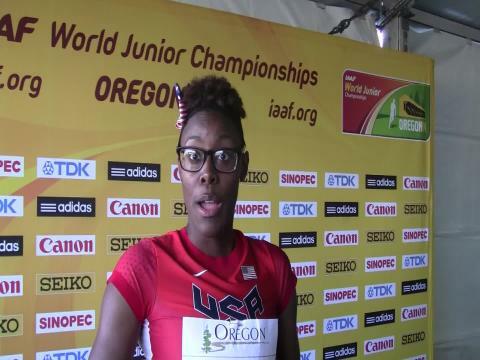 After many tears and an emotional rollercoaster ride that the last 24 hours have been following a DQ in the 200, the future Texas A&M Aggie and 2014 New Balance Nationals indoor and outdoor heptathlon champ Shaina Burns (MN) has not only decided to remain in the World Junior women's heptathlon competition, but she is fired up to get back on the track. 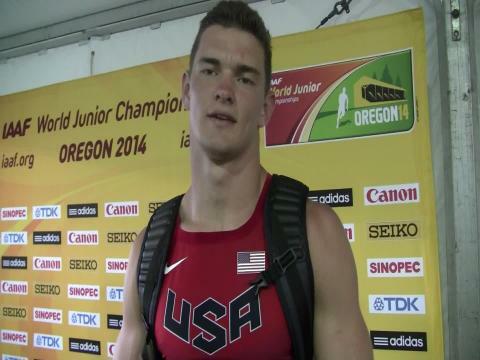 Results, recaps, twitter updates, photos, and video interviews from Saturday's evening session (day 5) at the 2014 IAAF World Junior Championships. 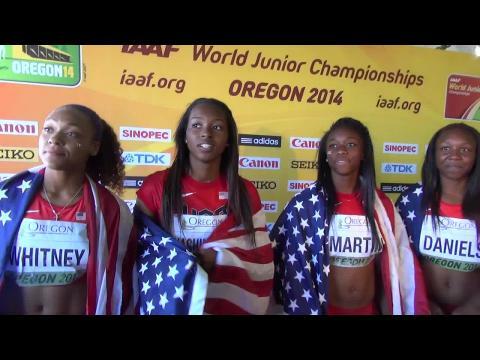 The quartet of Teahna Daniels (FL), Ariana Washington (CA), Jada Martin (GA), and Kaylin Whitney (FL) brought home gold for the United States in the first relay finals of the World Junior Championships with a World Junior leading time of 43.46. 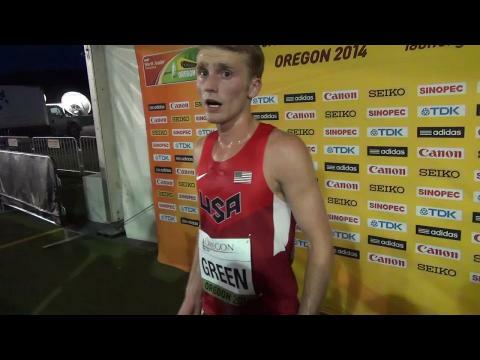 Watch their gold medal winning race video above and post-race video interview below. 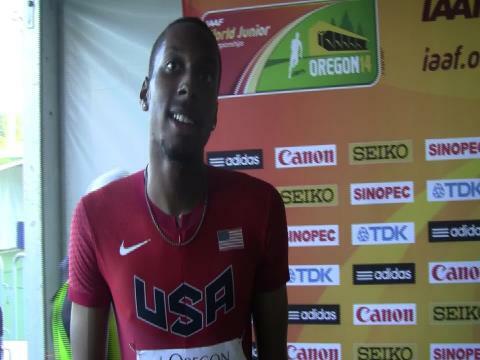 Watch the US men's 4x400 meter relay team at the 2014 IAAF World Junior Championships in Eugene, Oregon featuring three Virginians in Michael Cherry on anchor, Josephus Lyles on opener, and Ricky Morgan on third leg along with World Junior 400 meter finalist Tyler Brown from Ohio on second leg maintain an "Old Dominion" over the rest of the World. CHARLESTON – The best thrower in South Carolina – and one of the best at her sport in the country – has hopes of performing this summer on a much bigger stage, but she needs your help. 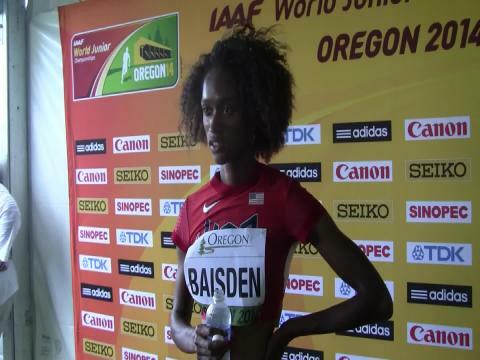 Watch Kendall Baisden & Olivia Baker go 1-3 for the United States in the women's 400 meter finals at the 2014 World Junior Championships. This past weekend the Commonwealth of Virginia, and more specifcally a select few athletes, proved it still was the place for quater milers. 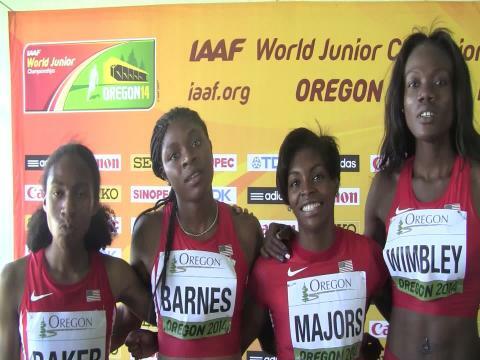 With three gold medalists in the 4x400 and another girl who helped the team qualify this was proven but doing. 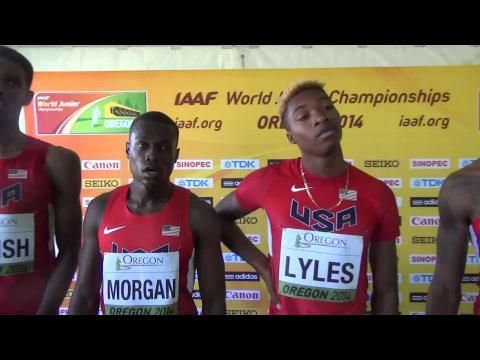 These elite athletes were Michael Cherry, Felecia Majors, Josephus Lyles, and Ricky Morgan. 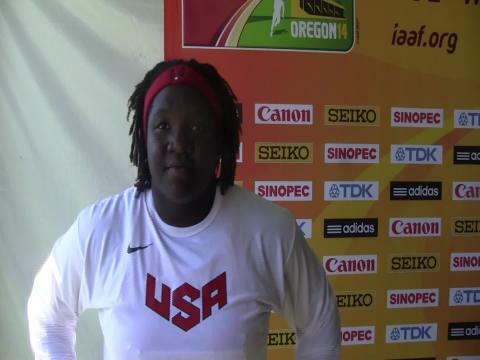 Girls shot put national record holder Raven Saunders tuned up in between competing in the U.S. Juniors last weekend and World Juniors in two weeks with the Burke graduate putting together an impressive series at in Illinois at the Chicagoland Throws with four marks over 50 feet. 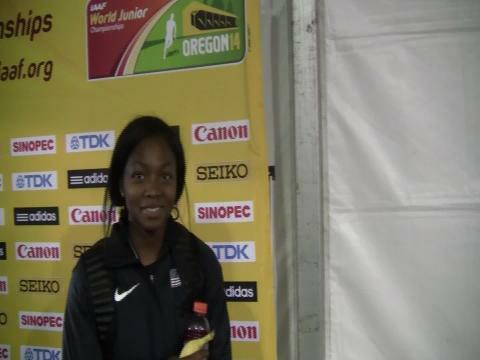 Zaza finishes 4th in the high hurdle world junior final! Ryan finishes 7th in the triple jump! Shearn finishes 15th in the 10,000 meter run! Watch the United States women go 1-2 in the 100 meter hurdles finals at the World Junior Championships with University of Georgia freshmen Kendell Williams set a new meet record with her 12.89 gold medal victory, while high school senior Dior Hall from Colorado broke a US high school record which lasted since 1979 (Candy Young from Pennsylvania at 12.95) with her 12.92 silver medal finish at Hayward Field. 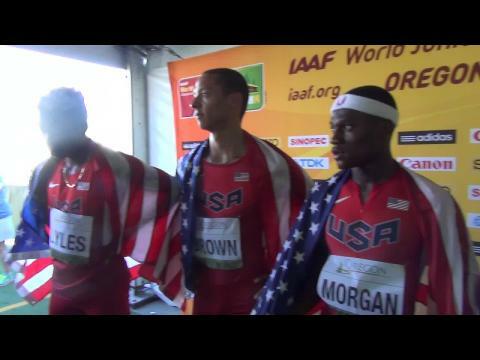 Add two more medals to the Team USA bank as both the women and men's 4x100m relay teams pulled the golden sweep. Both teams had a Florida flare with Teahna Daniels leading off for the ladies and Kaylin Whitney on anchor. The men's team featured 100m gold medalist Kendal Williams and silver medalist Trayvon Bromell with incoming FSU Seminole Trentavis Friday, the 200m gold medalist bringing it home. Also, in action Shakima Wimbley on the women's 4x400m relay and Daeshon Gordon competing in the 100m hurdle semifinals. 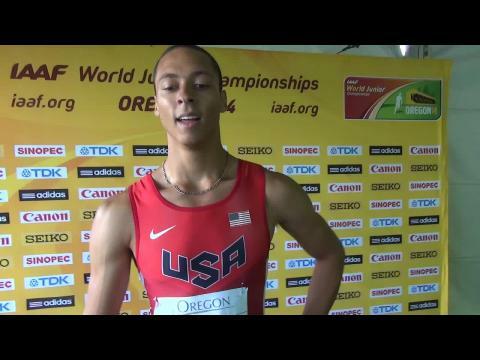 A list of Americans competing and highlights of their performances along with results, photos, and video interviews from the Wednesday morning session at the 2014 IAAF World Junior Championships in Eugene, Oregon. 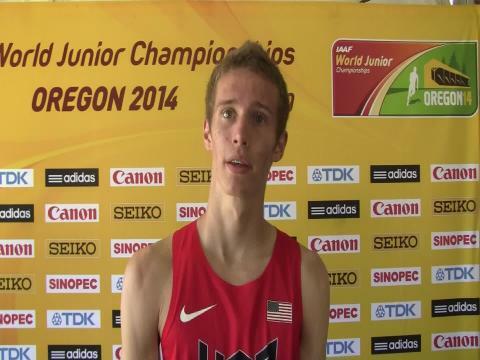 The IAAF World Junior Championships will have a Florida flare this week. 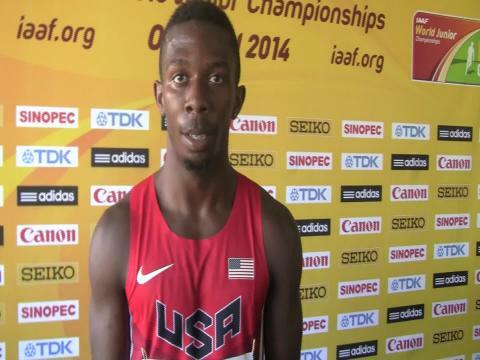 Nine Sunshine State speedsters will represent team USA on the largest stage for U20 track and field athletes while three others will represent others countries in this six day event. Stay tuned to flrunners and MileSplit for live results, photos, video interviews,and recaps of all the action! 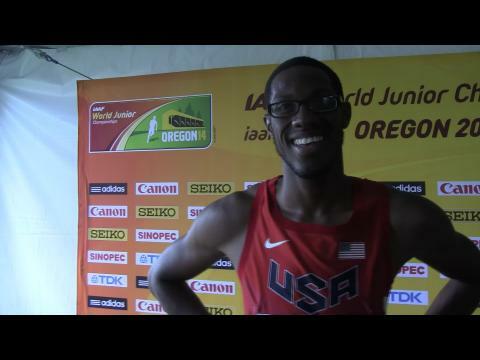 Results, recaps, twitter updates, photos, and video interviews from Friday's evening session (day 4) at the 2014 IAAF World Junior Championships. 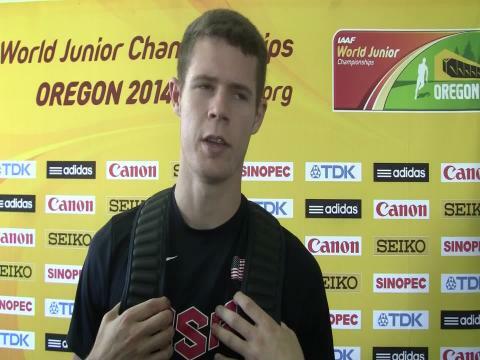 Start lists and live results from the 2014 IAAF World Junior Championships in Eugene, Oregon. 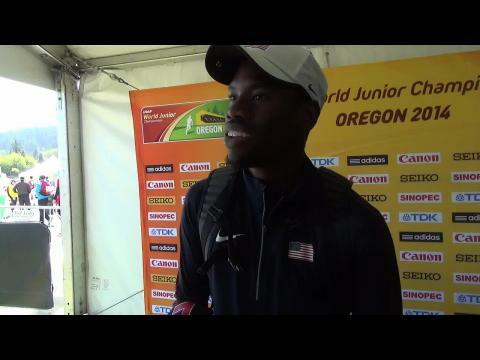 After winning the NCAA Championship 100 meter dash last month at Hayward Field, Trayvon Bromell returned to the historic University of Oregon track for USA Juniors. 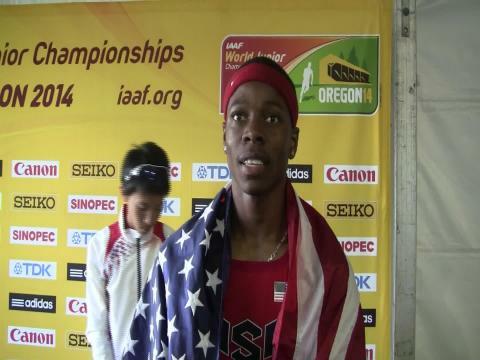 The performance wasn't quite the 9.97 he put up to win his first title as a Baylor freshman, but his 10.07 was good enough for the win and a spot on team USA at the World Junior Championships next week. 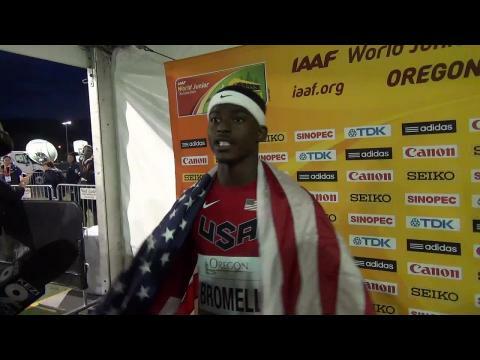 Bromell, one of the favorites to bring home gold will be blogging throughout his journey over the next week. 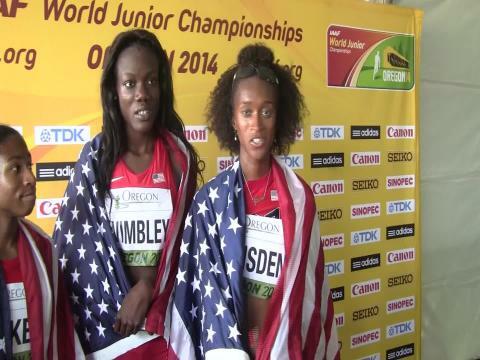 Results, recaps, twitter updates, photos, and video interviews from Sunday's session (day 6) at the 2014 IAAF World Junior Championships. 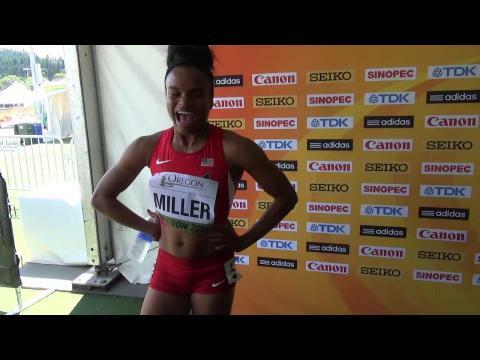 In the women's 400 meter hurdles finals at the 2014 IAAF World Junior Championships, the United States nearly had a 1-2 finish from Texas A&M's Shamier Little and Harvard University's Jade Miller. 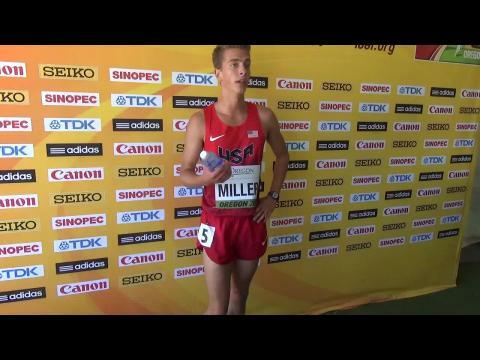 Watch Little and Miller's 1-3 finish race from World Juniors as well as their post-race interviews. 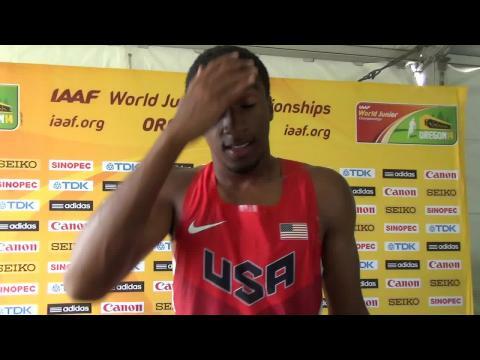 Team USA ran the fastest 4x400m relay time in the prelims, a world junior leading 3:23.73, and didn't disappoint as the favorites headed into the final day of competition at the 2014 IAAF World Junior Championships. Shamier Little led off for the Americans with Olivia Baker second and University of Miami freshman and former Dillard star Shakima Wimbley getting the baton as the third leg. 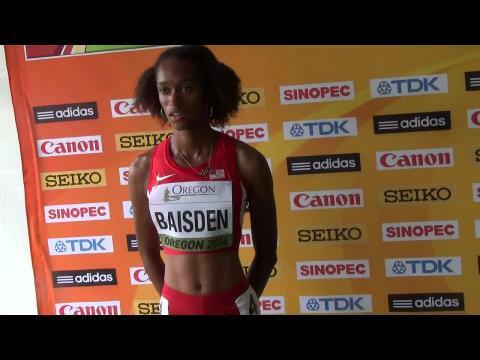 Kendall Baisden brought it home for the foursome, in 3:30.42, an improvement on their world junior leading time set the day before. Results, start lists, highlights, video interviews, and photos from Wednesday's evening session at World Juniors. North Schuylkill Alum Brendan Shearn has had an impressive first season at the University of Pennsylvania. The North Schuylkill alum was a varsity performer for the cross country team, scoring in every competition for the Quakers in 2013 on their way to a 4th place finish at the 2013 NCAA Mid Atlantic Regional Championships at Lehigh University. In track, Shearn earned a top five finish while running a personal best at The Penn Relays in the 10000 meter run (29:49.04). That performance earned him a ticket to the NCAA East Regional Preliminary Championships, where he would go on and finish 20th out of 48 runners. Shearn extended his outdoor season and competed in the 10000 meter run at the USATF Junior National Championships, earning a runner up finish and a ticket to the IAAF World Youth Championships later this month! 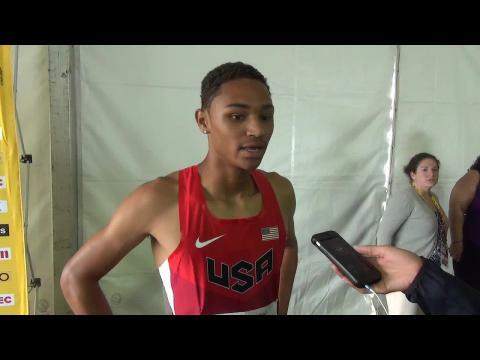 PennTrackXC caught up with the former two time state champion and got some of his thoughts on his first collegiate season, his performance at Junior Nationals and the upcoming World Youth meet. 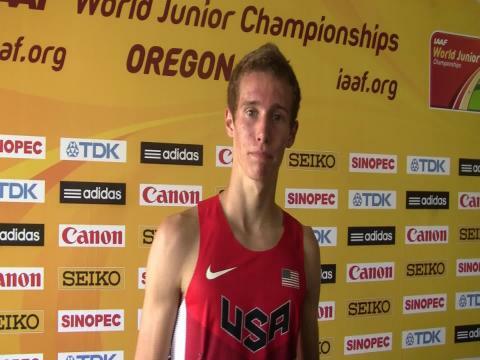 National feature story on Bailey Roth, who will be representing the United States in the men's 3K steeplechase at the World Junior Championships. Day four definitely provided fireworks especially for Floridians! 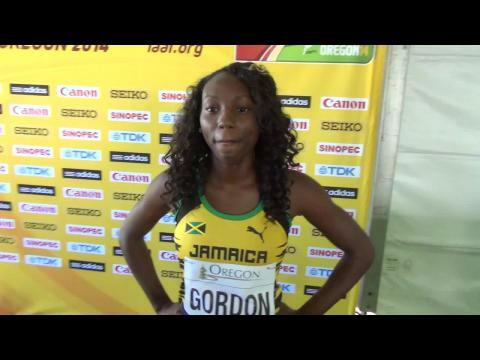 The morning session saw Daeshon Gordon, running for Jamaica, advance to the semis the 100m hurdles. 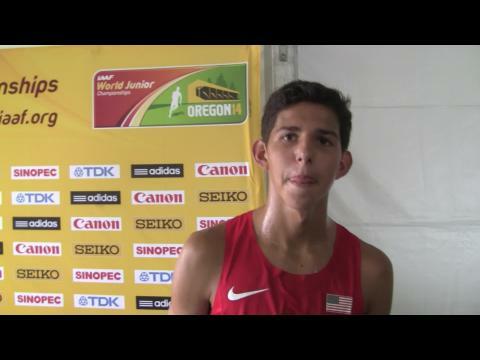 For UF freshman Andres Arroyo the year came to an end after a disappointing 800m prelim. However, it was the night cap where our stars shined the most. 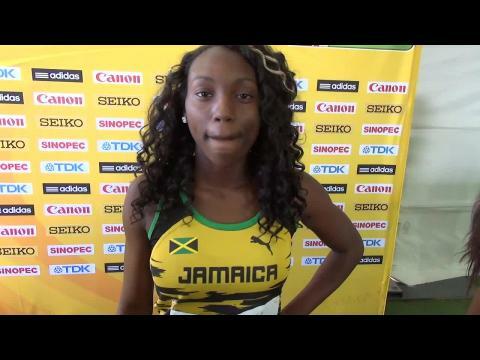 The girls 4x100m relay team set a new world junior leading time with Teahna Daniels leading it off. The boys 4x1 ran the second fastest time of the meet with Trayvon Bromell and Terry Jernigan running second and third. Capping off the night was a bronze medal showing in the 110m hurdles by T.J. Holmes and the second medal of the week for Kaylin Whitney, a gold in the 200m to go with her bronze in the 100! We wanted to capture all the action of day two through the photos taken by our professional photographer as well as from the parents of Kendal Williams and Kaylin Whitney. Enjoy! 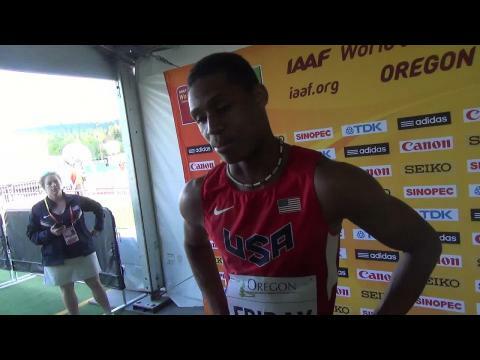 We said Floridians were ready to show out this week in Eugene and they did just that on day two of competition bringing home the first medals of the meet for Team USA on both the boys and girls side with Kendal Williams and Trayvon Bromell taking home gold and silver in the men's 100m dash and sixteen year old Kaylin Whitney bringing back bronze in the women's 100m dash! 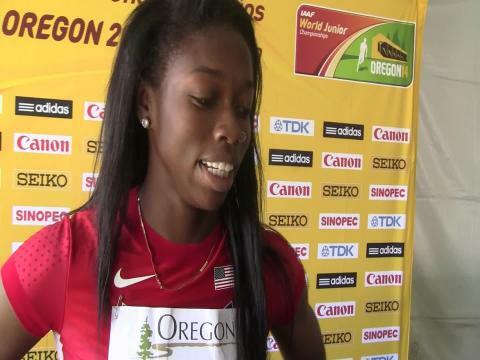 100m bronze medalist Kaylin Whitney and former Lakewood hurdler and Baylor freshman T.J. Holmes both advanced to the finals in their respective events after day three.Whitney owns the second fastest time headed into tomorrow night's 200m final and is looking for another medal, while holmes has the third fastest mark and hopes to join teammate Trayvon Bromell as Team USA men medalists. 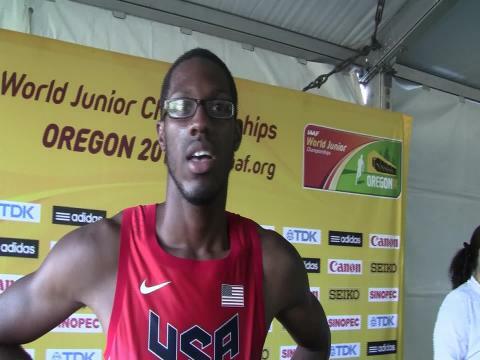 Tretez Kinnaird advanced to the 800m Final at the IAAF World Junior Championship in Eugene, Oregon tonight. 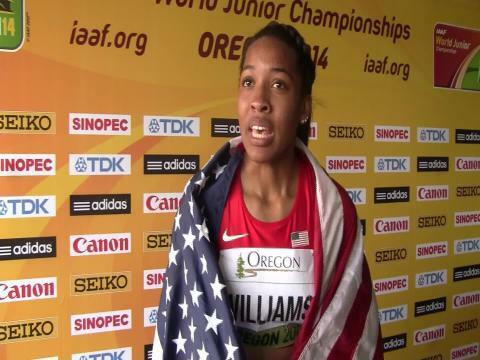 Eighty-nine athletes will represent Team USA at the IAAF World Junior Championships this week (July 22-27) at the University of Oregon’s Hayward Field. Eighty-nine of some our best teenagers (age 19 and under) from coast to coast that will be matching their talents against some of the finest across the globe. The Ocean State has two of its athletes in Eugene, former Barrington High all-stater Charlie Ionata and Central grad Clarence Gallop. 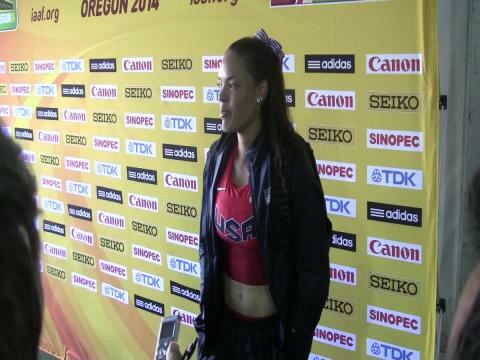 Both earned their spots by placing 1-2 in the hammer throw at the USATF Junior Nationals on July 5. 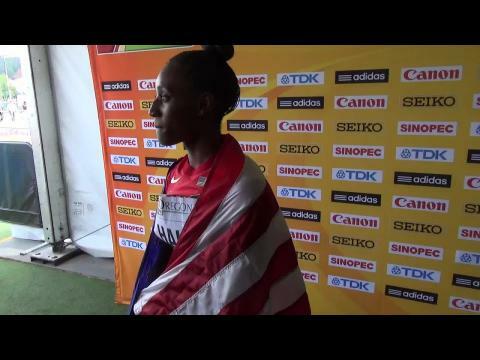 From preparation to race to victory laps around historic Hayward Field with the American flag draped over you, Florida athletes experienced it all. Check out these awesome images from Saturday's competion which saw several Floridians experience gold in the women's and men's 4x100m relays! 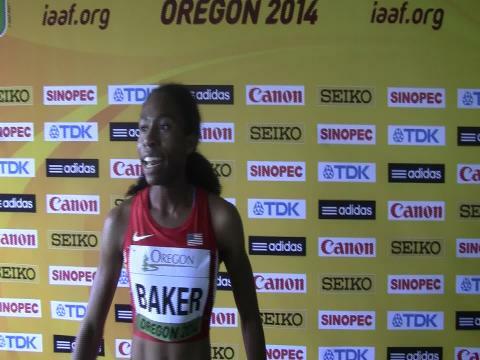 Burke's Raven Saunders shares a video saying thank you for helping her reach the fundraising goal. 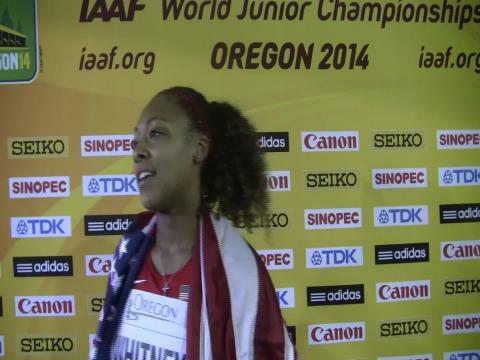 Kaylin Whitney had more medals than most countries at the 2014 IAAF World Junior Championships. At only 16, the East Ridge High School rising junior brought back gold medals in the 200m dash and as a member of Team USA's 4x100m relay. 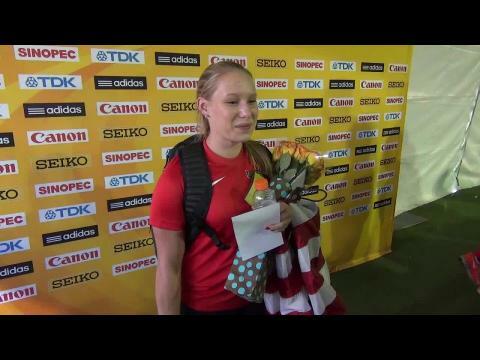 She also took bronze in the 100m dash. 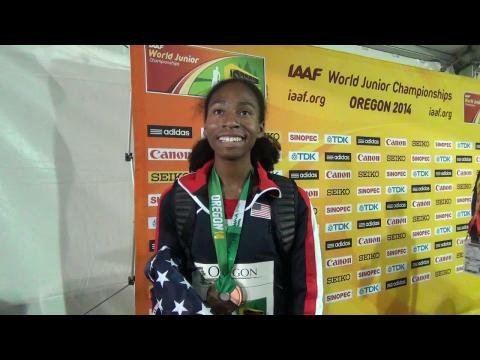 The three medals were the cherrry on top of one of the best seasons for a high school female sprinter we've ever seen. 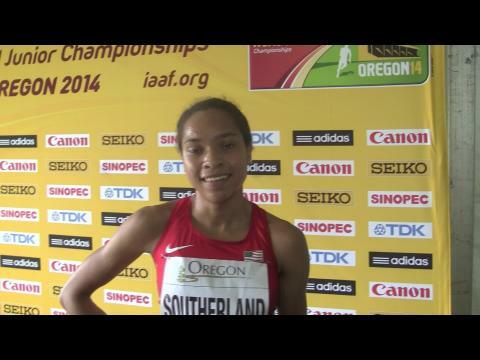 Her performance at World Juniors earned her a second USATF Athlete of the Week honor. Over a decade has passed since a major international sporting event was held on U.S. soil. 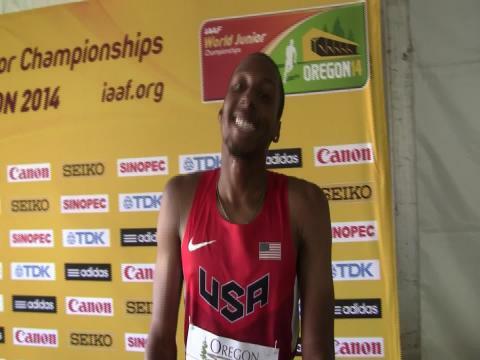 However, that will all change July 22-27 with the 177 member federations and the 1,758 junior athletes, ages 16-19, entered to compete in the 16th IAAF World Junior Championships at Historic Hayward Field on the campus of the University of Oregon. 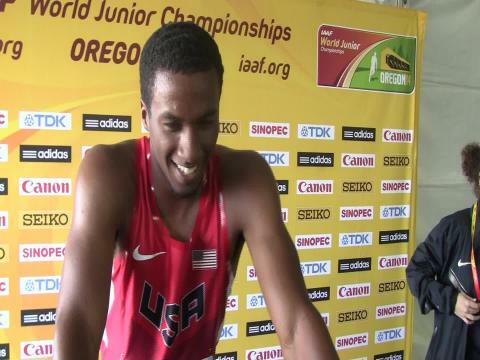 Watch the highlight videos of finals action from this week's IAAF World Junior Championships in Eugene (courtesy of Universal Sports). 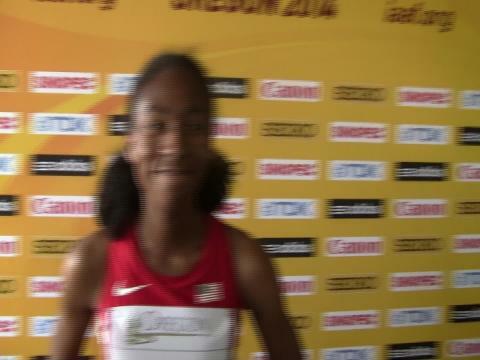 Kaylin Whitney records her second medal of the World Junior Championships; a golden token for the USA's new golden girl. 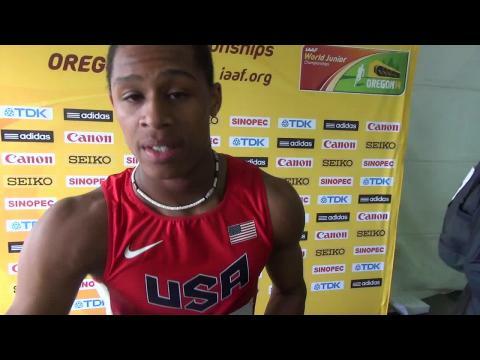 Baylor freshman TJ Holmes takes home bronze and the 4x100m relay teams advance to the finals. Check out all the photos from day four! 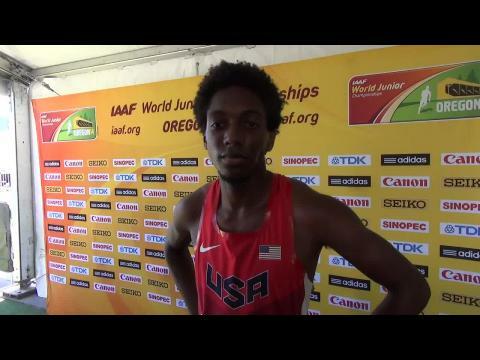 Tre’tez Kinnaird capped off a memorable freshman season with a sixth-place finish in the 800m at the IAAF World Junior Championships Sunday at Hayward Field. 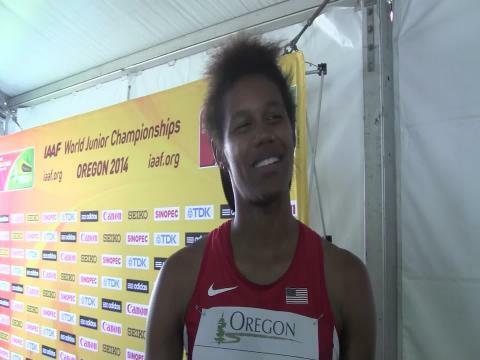 Hope High junior Quashira McIntosh is the lone Rhode Island runner at this week's IAAF World Championships, held Tuesday through Sunday at the University of Oregon's Hayward Field. 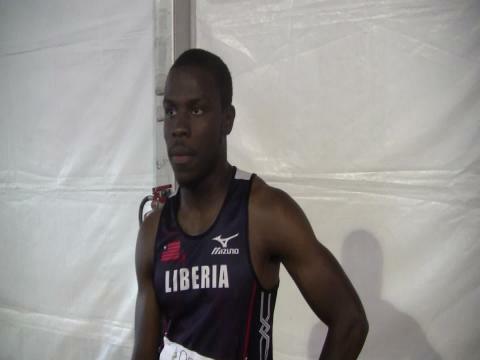 McIntosh will be competing as a member of the Virgin Islands National Team. 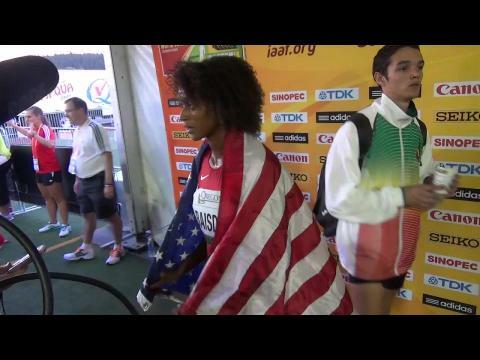 Unlike the U.S. athletes, she was chosen to represent her homeland based on her previous performances and did not have to run in a qualifier. 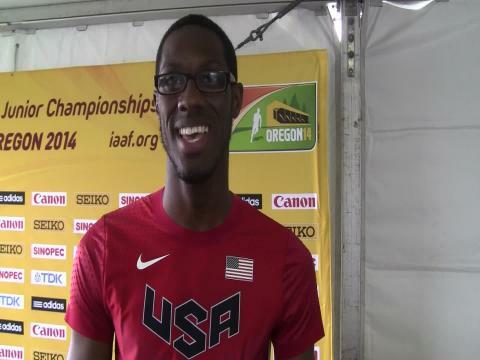 Former Butler Great Tretez Kinnaird did a radio interview last week about the IAAF World Junior Championship in Eugene. Tre moves on to the next round. 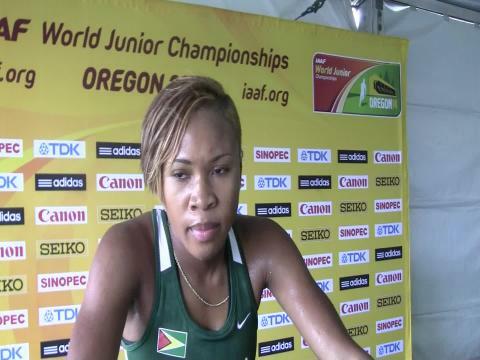 The provisional entry list for the 2014 World Junior Championships to be held next week at University of Oregon's Hayward Field in Eugene with a total of 167 countries represented among 1,540 athletes entered. The official start lists which include the final scratch downs will become available on Monday, July 21st at 4 PM PST before the first day of competition. Check out these awesome images from day three of the World Junior Championships! 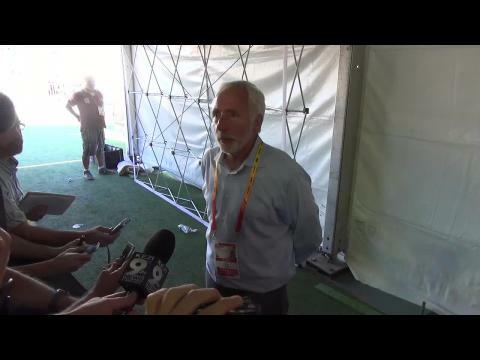 Jim Spier of the NSAF makes his medal count prediction for Team USA in the upcoming World Junior Championships this week, being held for the first time on American soil at historic Hayward Field in Eugene, Oregon. Spier projects 17 medals for the US junior women and 13 medals for the US junior men for a total haul of 30 medal. 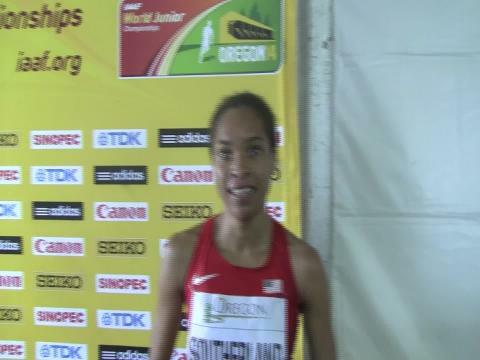 Sabrina Southerland, former New York High School star and current middle distance specialist for Georgetown University, will be the lone American in the women's 800 semifinals after finishing third in her prelim heat with a time of 2:05.84 as an auto qualifier, which puts her as 9th fastest overall and a real contender to make it out of the next round. The two All-Americans both were heat winners in the 110 meter hurdles with California state champ Misana Viltz of Millikan High School taking heat 2 with a 13.59 clocking and University of Kentucky freshmen Nick Anderson (competed in Florida for high school) winning heat 3 with a 13.61 performance. 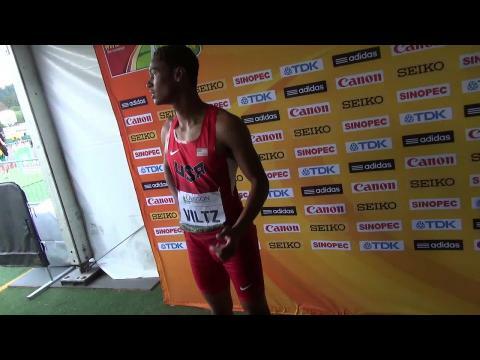 Viltz, the US #2 ranked high school hurdler in the country, is in good position to compete for a top 3 medal if he can make it through the next round of the 110 meter hurdles. 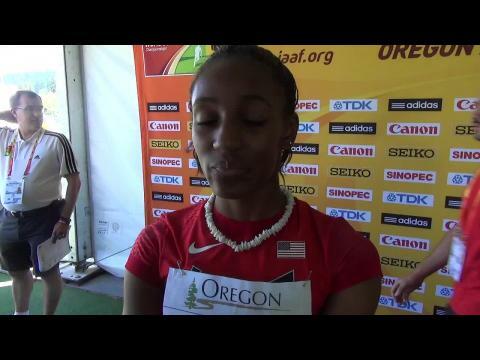 Post-race interview with Kinkaid School (TX) graduate and incoming University of Oregon freshmen Raevyn Rogers after a disappointing showing in the first round of the World Juniors 800 prelims finishing 6th in her heat with a time of 2:08.01 after being clipped on the first lap of the race while leading. 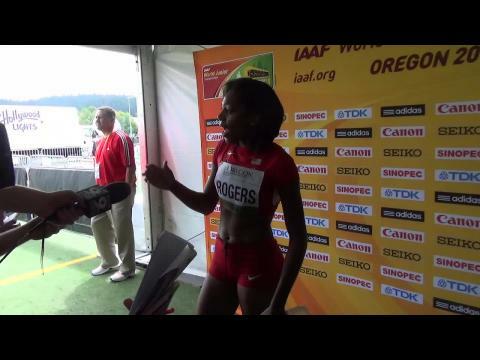 The 2013 World Youth bronze medalist Raevyn Rogers looks back on her accomplished high school career and next challenge ahead in college. 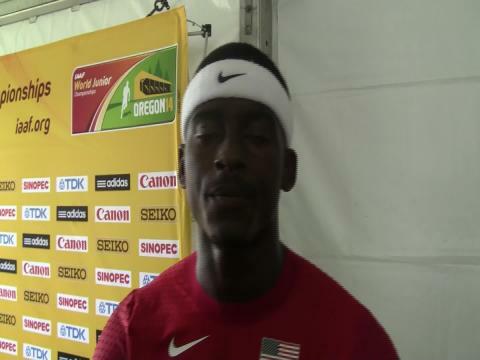 World Junior 100 meter dash record holder Trayvon Bromell has quickly shown himself as the class of the junior men's field in the 100 meter after this first round with his 10.13 clocking from heat 6 easily putting him a full tenth of second faster than the next fastest qualifier, which happens to be USA teammate Kendal Williams. 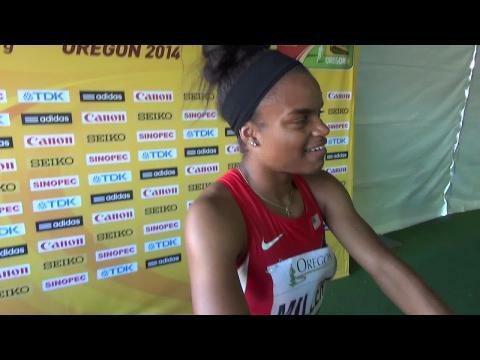 The Baylor University freshmen and NCAA champ is looking to claim another major title at Hayward Field. The chances of the US going 1-2 in the men's 100 meter dash for gold and silver medals were already looking good with the likes of Florida grown Trayvon Bromell and Kendal Williams representing the country in the World Junior Championships, but those odds looked even better after Williams ran a smooth looking 10.23 lifetime best clocking to win his heat in the first round. 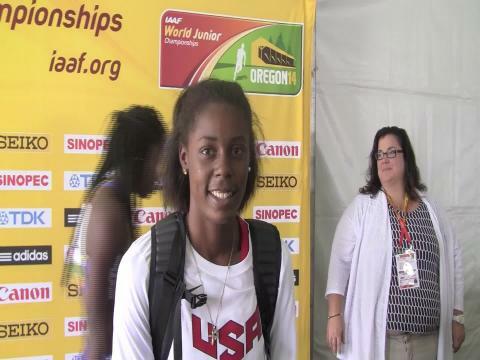 Despite a slow start of the blocks, Kaylin Whitney was able to recover in the next phases of her race to comfortably win her first round heat of the 100 meter dash at the World Junior Championships with a 11.49 clocking. 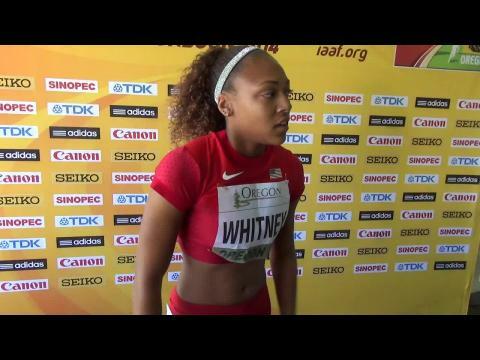 In her post-race interview, Whitney is clear that her focus is conserving as much energy as possible through the first two rounds and let it all out in the finals to compete for the gold medal and challenge her own US high school national record of 11.10. 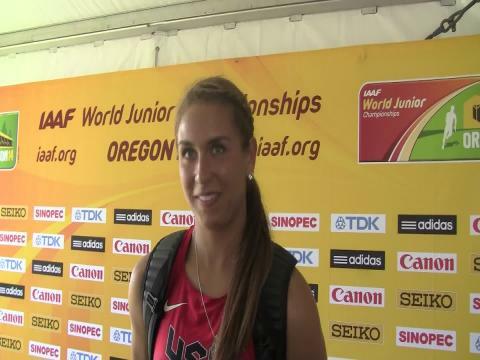 One of Arizona's most versatile high school athletes ever in Ashlee Moore will be ranked 11th going into day two events of the World Juniors women's heptathlon with total score of 3,331 points for her first 4 events with a 13.59 PR in the 100 hurdles, 1.73m clearance in the high jump, 9.87 mark in the shot put, and 25.05 clocking in the 200 meter dash. 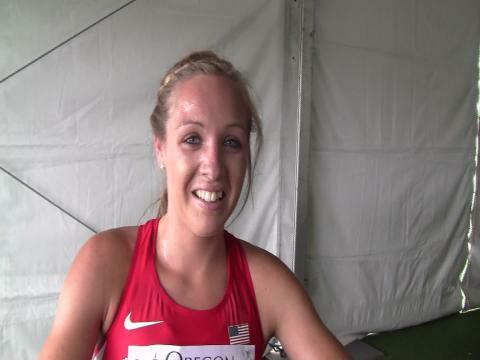 The incoming University of Oregon recruit is hoping to move back up in the top 10 on day two. A relatively unknown runner nationally one year ago while winning state titles in his senior year of high school back home in Ohio, Eastern Michigan University freshmen Tyler Brown is now in position to compete for a medal and potentially gold on the World stage at the World Junior Championships in the 400 meter dash. 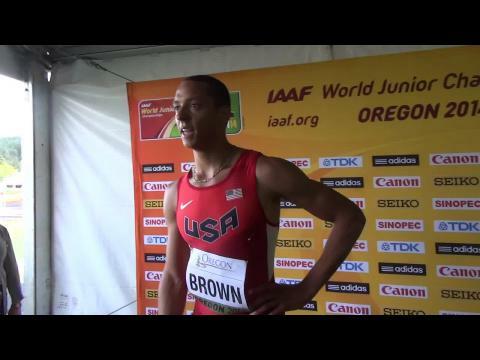 The second fastest qualifier coming in the meet, Brown opened up his weekend winning his prelim heat by withstanding a late challenge from Great Britain's Jack Crosby for a 46.45 victory to move onto the next round. 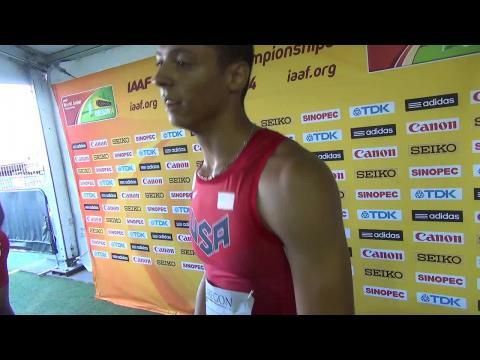 Memphis University School recent graduate Harrison Williams (TN) got off to a strong start in the 100 meter dash this morning (10.75) to start off the decathlon, but had to work himself back into the top 10 overall standings at the end of day one with a 48.21 performance in the 400. In the field events making up the middle portion of his busy day, Williams leaped 6.80m in the long jump, threw 13.53m in the shot put, and cleared 1.94m in the high jump. 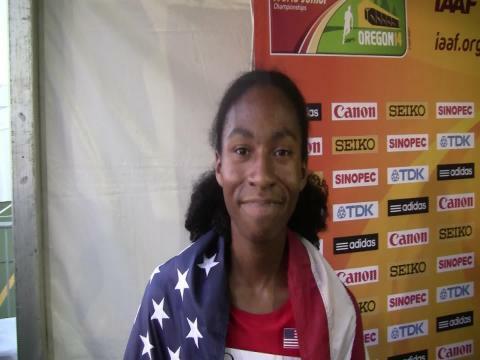 One of the top high school track & field athletes from the state of Rhode Island in Hope High School rising senior Quashira McIntosh, also happens to be a native born of the US Virgin Islands (the island of St. Croix to be exact). 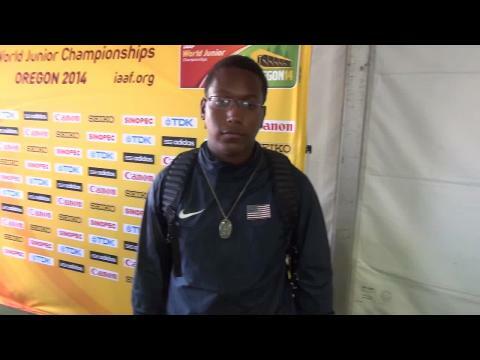 With that lifelong tie to the island, McIntosh got the opportunity to represent the USVI's on Tuesday at day one of the World Junior Championships in Eugene, Oregon in the prelims of the 100 meter dash. 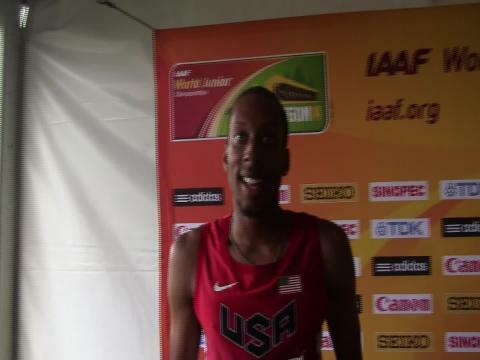 McIntosh did not advance onto the next round, but relished the opportunity to compete on the international stage as well as alongside American high school record holder Kaylin Whitney in the same heat. 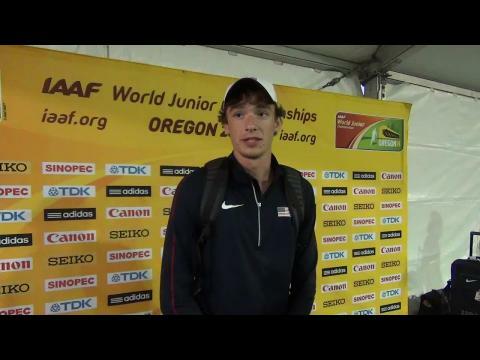 Freeport High School (FL) recent graduate and incoming University of Arkansas freshmen Gabe Moore has one simple motto for tomorrow's second hald of the decathlon competition at the 2014 IAAF World Junior Championships: "Time to pick it up". 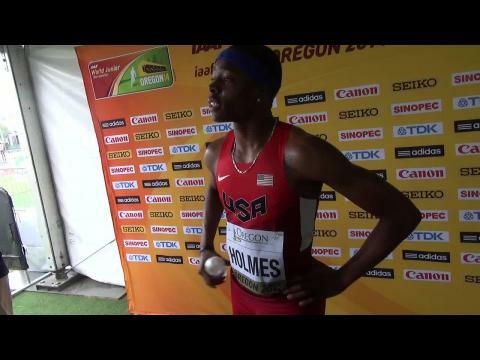 Moore has been competing close with US teammate Harrison Williams (TN) including directly head to head in same heats of 100 and 400 meter dashes on Tuesday. 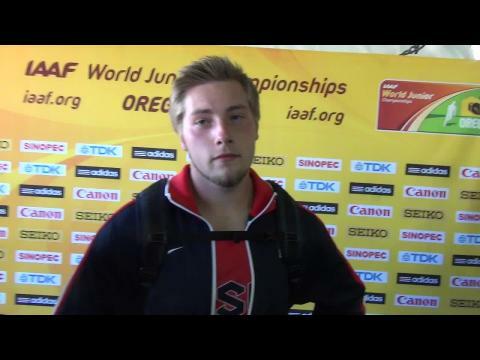 Looking for the hurdles and discus early on Wednesday to help him move up from his current 12th place position in the overall event standings. This was awesome. An orchestra playing 10,000 meters worth of music. 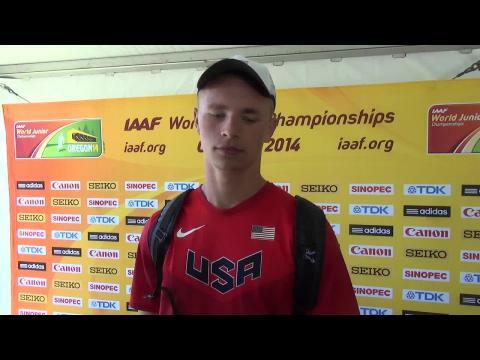 So were the rest of the highlight photos from day one from the 2014 IAAF World Junior Championships. Uganda's Joshua Kiprui Cheptegei wins the first gold medal of the 2014 IAAF World Junior Championships by pulling away from Kenya's Elvis Kipchoge Cheboi and Nicholas Mboroto Kosimbei on the final lap for a 28:32.86 victory in the men's 10,000m. 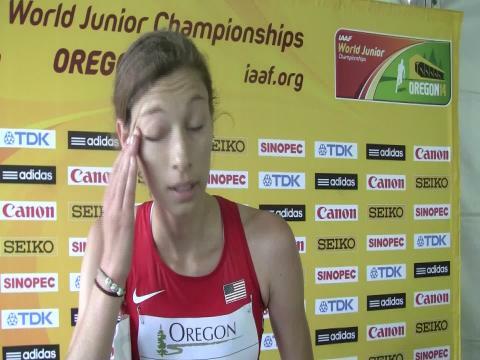 Katie Newhoff (NY) knocked nearly a full minute off her PR in 10K Racewalk with her 51:40.42 performance at the World Junior Championships as the lone American competitor in the field. 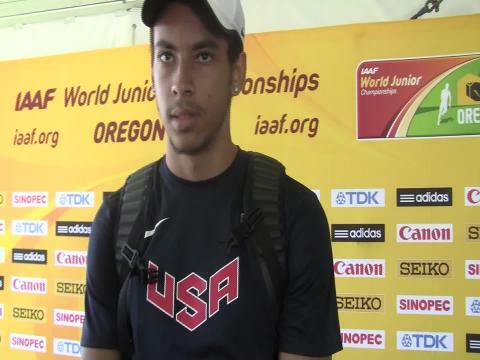 Travonn White from Arizona sits in fifth place going into the finals of the long jump after a 7.5 meter mark (24'7.25") in the preliminary qualifying rounds of the long jump on Wednesday morning at Hayward Field in Eugene for the World Junior Championships. 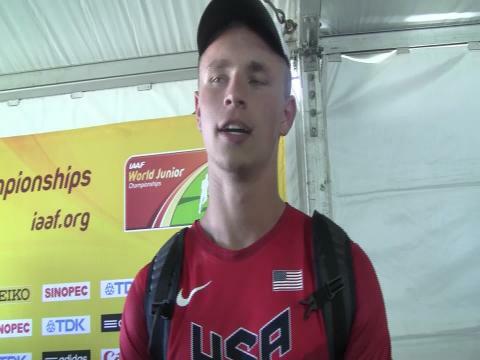 White, who hit a mark of 26'4.50" at the US Junior Nationals, feels confident with better weather conditions in the finals to leap himself into a top 3 medal position. 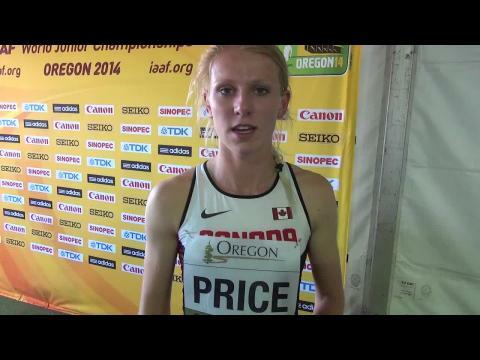 It was a surprise to see Madeline Price come through the mixed area wearing a Team Canada singlet. 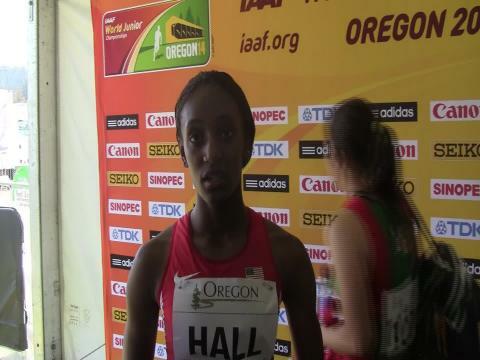 The California 400 state runner-up and MileSplit US All-American has dual citizenship through her parents both being being natives and born in Canada. She had a successful first round of the 400 meter dash trials posting a time of 53.86 to finish second in heat and automatically move onto the semi-finals. 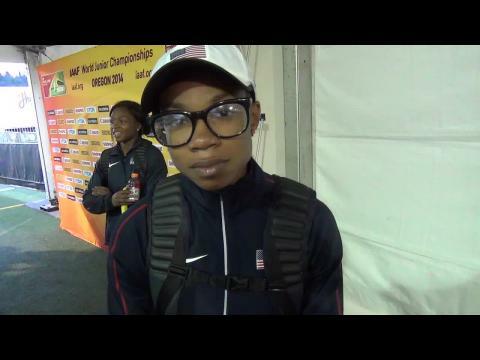 University of Texas freshmen Kendall Baisden, a former high school track from the state of Michigan, looked the part as the pre-meet favorite and gold medal contender in the 400 meter dash as she dominated her first round qualifying race with a 53.28 clocking in the rain. 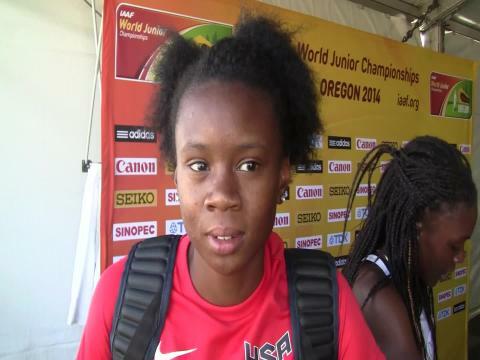 Olivia Baker of New Jersey, the nation's best high school quarter miler from this past year, looks to have the inside track on making the 400 meter dash finals at the World Junior Championships after winning her preliminary heat from the inside lane comfortably in a time of 54.09 on Wednesday morning. 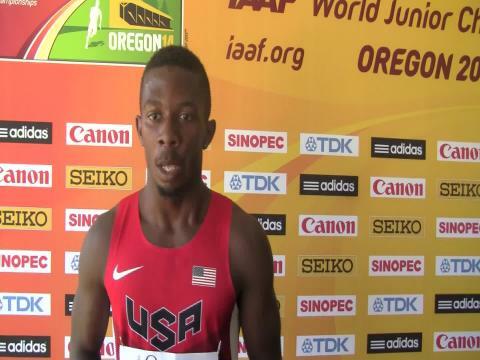 Despite being a veteran to the IAAF World Championships meet experience as a World Youth bronze medalist last summer in Ukraine, the feeling is just the same for US hurdler Kenny Selmon. Nothing like it. 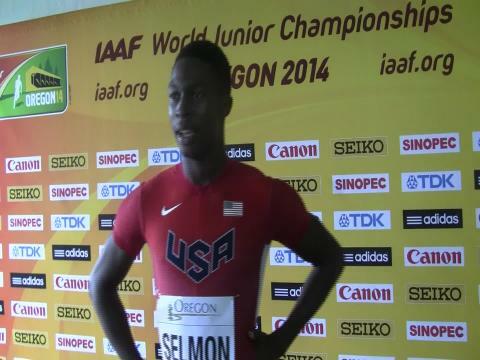 Selmon won his preliminary heat with a 52.15 clocking and appears in strong contention to compete for a World championship medal again. 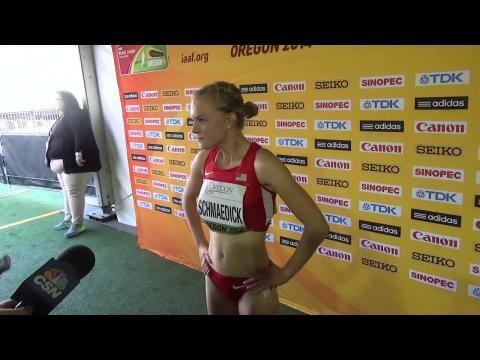 A World Junior record was set by Anezka Drahotova in a time of 42:47.25. That is walking back to back 21:23 5K's. 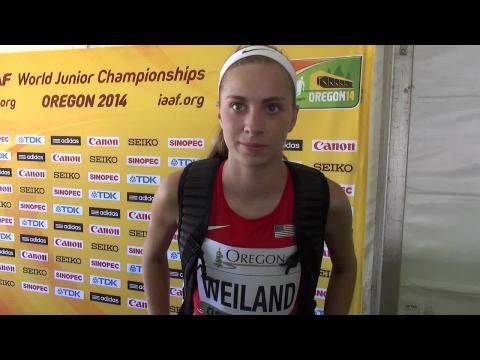 She could walk her way onto many high school girls XC team's top 7s this fall! 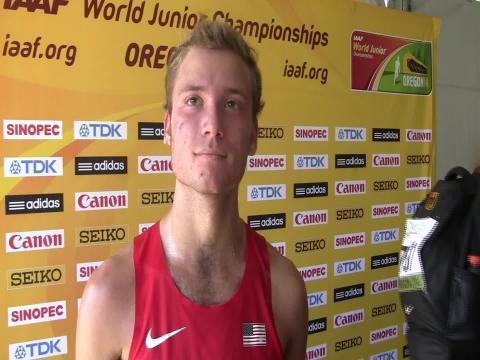 Harrison Williams of Memphis University School in Tennessee set an American high school record in the men's decathlon using junior international implements with his final tally of 7,760 points at the World Junior Championships with his 6th place overall finish in the two day competition. 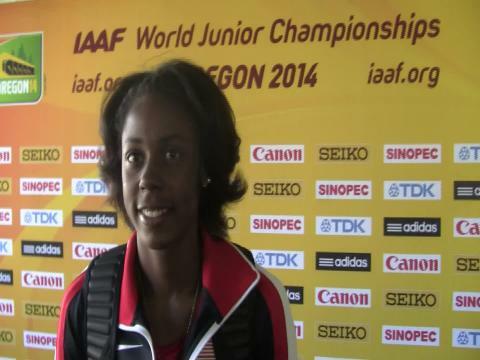 Watch the race video of women's 100 meter dash finals from the 2014 IAAF World Junior Championships. Despite the cold, rainy, and gloomy weather that stuck around all day for Wednesday's events for the World Junior Championships, it was the Sunshine state of Florida and two of their very best bringing a lot of heat and energy to the track in the men's 100 meter dash in a moment that should spark the host country American teams to more medals throughout the rest of the week. 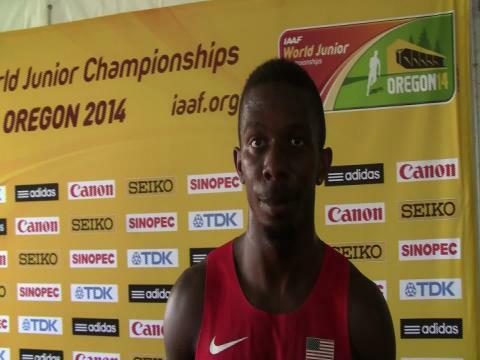 Watch the race video of the men's 100 meter dash finals from the World Juniors. 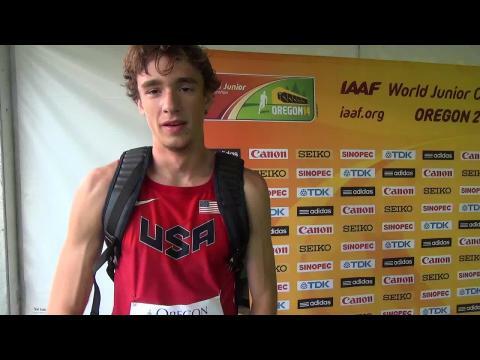 Featured photos by TrackTown Photo from Wednesday's events at the 2014 IAAF World Junior Championships in Eugene, Oregon. 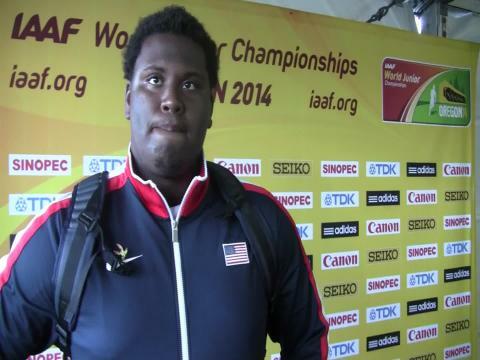 UCLA freshmen and New Jersey native Braheme Days was the top performer in his preliminary qualifying flight of the men's shot put and sits second overall with his mark of 19.61 meters heading into the finals of the World Junior Championships. 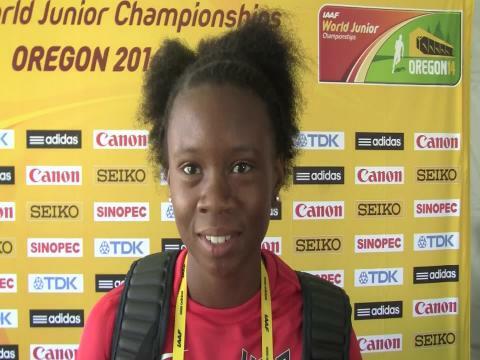 It only required one jump, which was a season best mark of 13.46 meters for Keturah Orji of Mount Olive High School in New Jersey to move onto the finals of the women's triple jump competition at the World Junior championships. 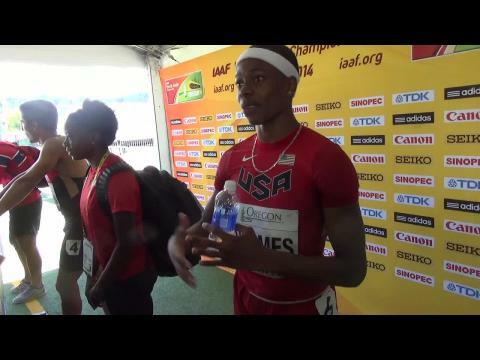 In his 400 meter hurdles semi-finals race on Thursday morning, Baylor University freshmen and Florida native TJ Holmes showed that he has the speed and endurance to finish all of his races better than anyone else. After slow start struggles in the rounds of the 100 meter dash before ultimately earning a bronze medal in the finals on Wednesday night at the World Junior Championships, Kaylin Whitney got off to a much faster start out of the blocks in her preliminary race of the 200 meter dash before shutting it down at the end and cruising in for 23.31 victory to move onto the semis. 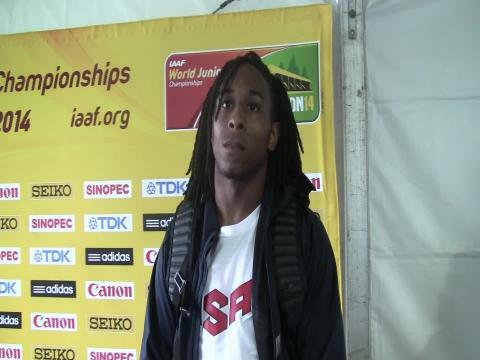 Trentavis Friday had to sit through all the rounds of the 100 meter dash despite being the US high school record holder in the event over the past two days. The incoming Florida State University freshmen from North Carolina showed that he was chomping at the bits to race as he literally tomahawk chopped the competition in his first round of the 200 meter dash. 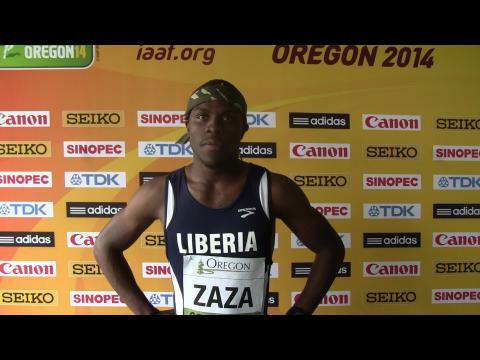 Featured photos by TrackTown Photo from Thursday's events at the 2014 IAAF World Junior Championships in Eugene, Oregon. 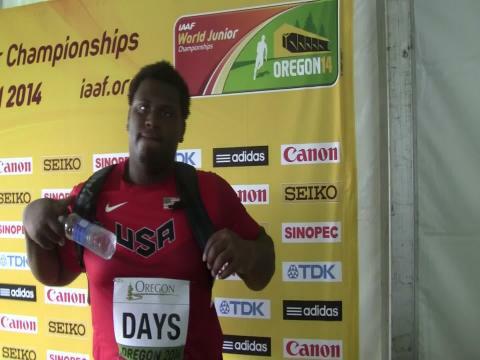 Braheme Days Jr, a native of New Jersey who just finished his freshmen year at UCLA, became World Junior bronze medalist in the shot put with his best mark on the day of 20.01 meters. 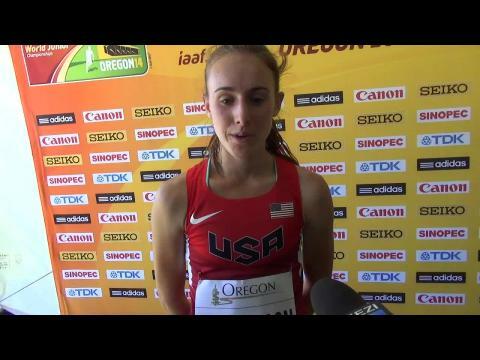 Many looked to Mary Cain to deliver a rare distance medal for the United States at the World Junior Championships and she delivered in a electrifying fashion for her home crowd at Hayward Field in Eugene. 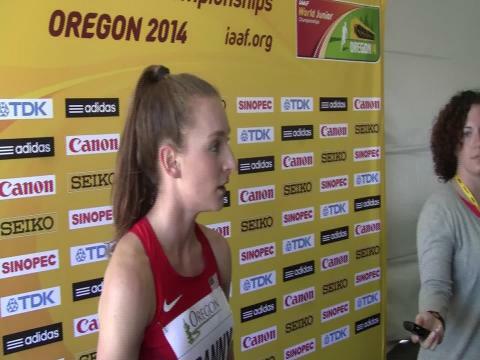 Watch Mary Cain win the women's 3K title at the World Junior Championships in this highlights footage from Universal Sports. 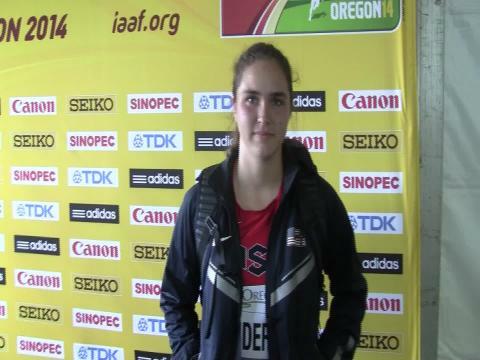 Desiree Freier in one vault claimed the World Junior silver medal as well as the American high school and junior record in the pole vault with a successful clearance of 4.45 meters or 14'7.25" at the IAAF World Junior Championships on Thursday night at Hayward Field in Eugene, Oregon. 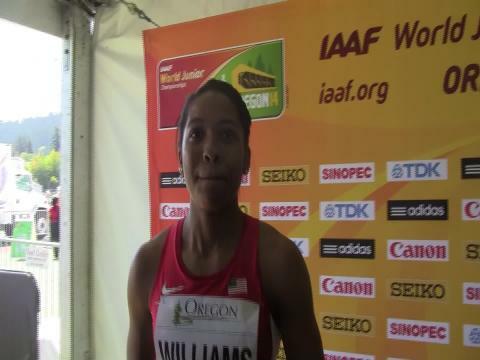 Listen to her video interview after the competition. 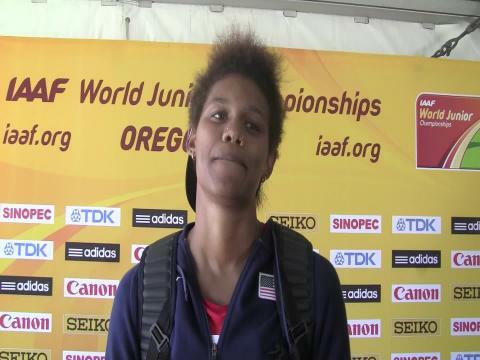 The next member of the US junior women's team at the World Junior Championships with a great chance to medal will be Raven Saunders. 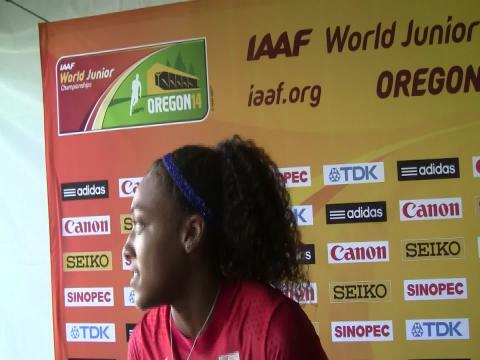 Watch our interview with Saunders after her prelim qualifying performance (54'10.75") before she competes in tonight's finals at 6:35 PM PT. 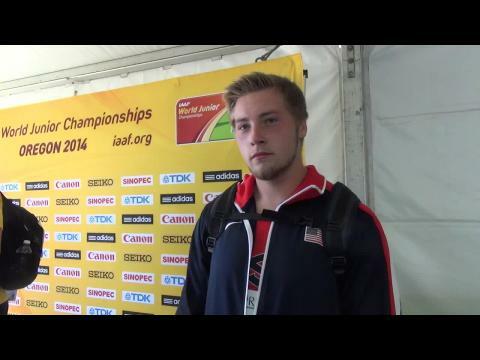 With only one throw required to the hit finals qualifying mark in the discus throw prelims, Kansas state champ Kord Ferguson will be will rested and ready to build up for a medals push in the World Junior Championships finals tomorrow. 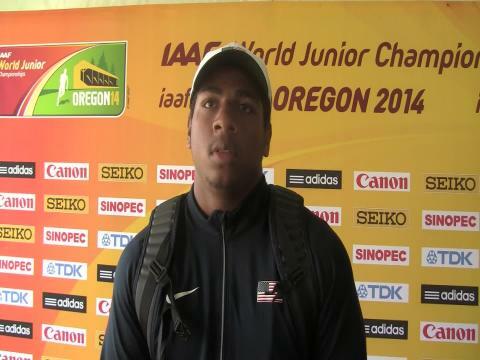 Watch our post-prelims interview with one of the nation's top discus throwers in Ferguson from World Juniors. Incoming Stanford University recruit Elise Cranny from Colorado just focused on staying relaxed and taking one of the top four spots in the women's 1500m semis (4:15.21) on Friday morning at the World Junior Championships as she kicked her way on the final lap to a fourth place position before easing up before the line to save for the finals. 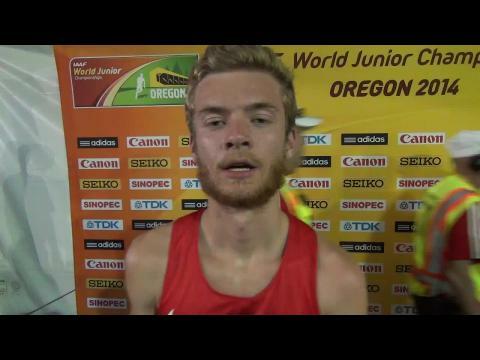 Watch our post-prelims race interview with Cranny. 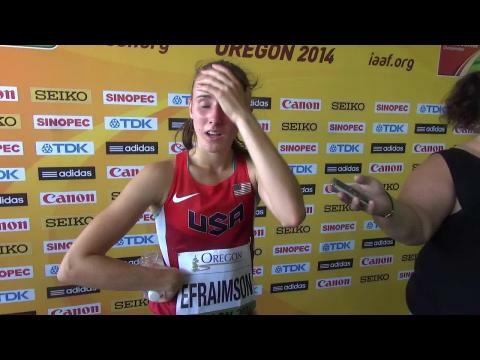 Alexa Efraimson might have run the cleanest and smartest race in the history of World Championships 1500 meter prelims. 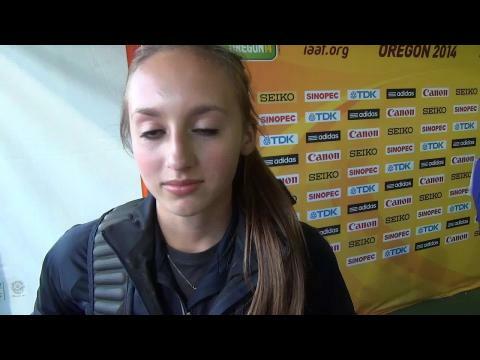 Okay that might be an exaggeration, but still the rising Camas High School (WA) senior Efraimson ran an incredibly smart and energy efficient race to set herself up well for the finals. 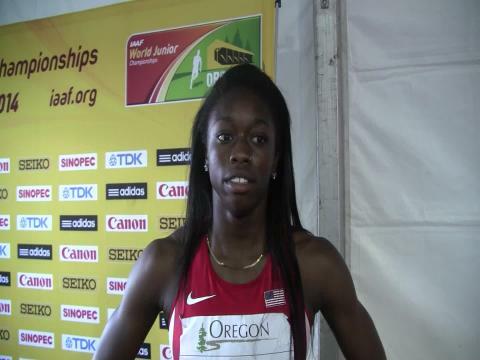 Watch her post-prelims race interview from World Juniors. 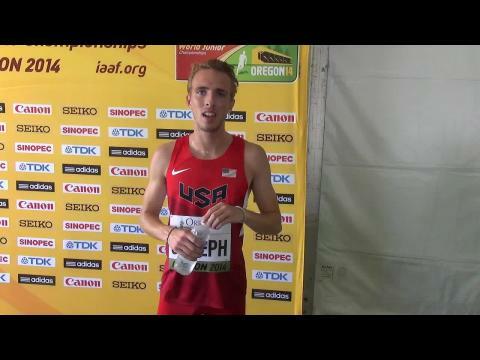 Bailey Roth took down a 35 year old US high school national record in the men's 3K steeplechase in his preliminary heat at the World Junior Championships with a 7th place time of 8:48.60. The time also was enough to advance him onto the finals of the event. 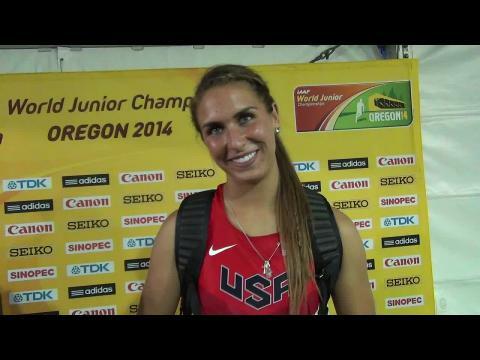 Featured photos by TrackTown Photo from Friday's events at the 2014 IAAF World Junior Championships in Eugene, Oregon. 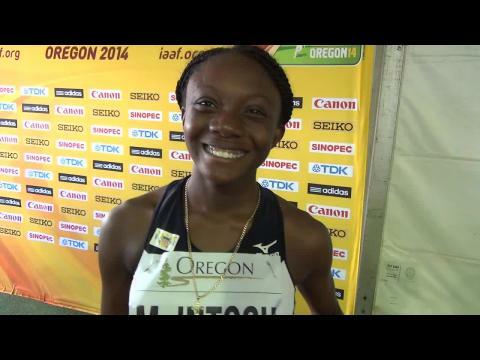 Featured photos by TrackTown Photo from Saturday's events at the 2014 IAAF World Junior Championships in Eugene, Oregon.